We’d love your help. Let us know what’s wrong with this preview of The Library of Ever by Zeno Alexander. Enter for a chance to win an ARC of THE LIBRARY OF EVER! The Library of Ever is an instant classic for middle grade readers and booklovers everywhere—a Enter for a chance to win an ARC of THE LIBRARY OF EVER! To ask other readers questions about The Library of Ever, please sign up. This book was sort of if the Phantom Tollbooth was crossed with that series the Librarians. I don't want to give anything away, but I will say that this is an enjoyable, satisfying middle-grade book. Worth picking up for sure. It has the sort of tone of a latter-day old-timey book, like a Lemony Snicket, say, that would make a great book to read aloud to a fourth grader. I loved the main character and the way that literature is celebrated. Wonderful read. Thanks to NetGalley for the ARC in excha This book was sort of if the Phantom Tollbooth was crossed with that series the Librarians. I don't want to give anything away, but I will say that this is an enjoyable, satisfying middle-grade book. Worth picking up for sure. It has the sort of tone of a latter-day old-timey book, like a Lemony Snicket, say, that would make a great book to read aloud to a fourth grader. I loved the main character and the way that literature is celebrated. Wonderful read. Okay. Wow. Wow. Wow. How to review without spoiling? Hmmmm. Well, you’ve read the synopsis. You know it’s a fantastical adventure about a precocious girl named Lenora that takes place in a library. But it’s SO. MUCH. MORE. It’s about knowledge vs. ignorance and darkness vs. light and reminds me so much of those great middle grade classics like A Wrinkle in Time and Harry Potter. I can only pray that we hear more from Lenora and her continued quest to keep the light in the world. I will, without Okay. Wow. Wow. Wow. How to review without spoiling? Hmmmm. But it’s SO. MUCH. MORE. It’s about knowledge vs. ignorance and darkness vs. light and reminds me so much of those great middle grade classics like A Wrinkle in Time and Harry Potter. I can only pray that we hear more from Lenora and her continued quest to keep the light in the world. I will, without a doubt, be sharing this one with my students (maybe as a read aloud?) when it publishes in April. Oh my goodness, I adored The Library of Ever. This book is everything a cozy middle grade book should be. I wish I could go back in time and press it into the hands of my ten-year-old self with a conspiratorial wink. Lenora is ignored by her wealthy parents and her nanny, but this comes in useful sometimes--like at the library. She makes her escape to the children's section where she confronts a man in a bowler hat who is trying to tell a young boy that books on science are too advanced for him. Oh my goodness, I adored The Library of Ever. This book is everything a cozy middle grade book should be. I wish I could go back in time and press it into the hands of my ten-year-old self with a conspiratorial wink. Lenora is ignored by her wealthy parents and her nanny, but this comes in useful sometimes--like at the library. She makes her escape to the children's section where she confronts a man in a bowler hat who is trying to tell a young boy that books on science are too advanced for him. After seeing the boy get to the books he wants, a fantastic archway appears in what had been a blank wall. She walks through, and finds the Library of Ever. I envisioned her adventures in the library like a Hiyao Miyazaki anime. Everything is fantastical and weird, yet within this world, absolutely believable. Lenora is quickly dubbed a library worker of low rank, bestowed a badge and everything, and happily goes to work. As she helps patrons--jumping ahead in time to resolve a calendar issue, wandering a massive globe and befriending whales and penguins (and finding out some purported facts about the longest town name and highest mountain aren't true)--her rank advances, as do her responsibilities. While the book is sure fun, there's also a powerful message behind everything about the dangers of censorship and the power of knowledge. The men in bowler hats are a threatening force. As Lenora is scolded at one point, "I thought you were wise enough to understand that children must be discouraged from asking questions that will make them curious and fretful. Perhaps I overestimated you. After all, you're just a child yourself." "Maybe," said Lenora, with equal frost. "But I'm also a librarian. And I'm not going to hide the truth from anyone." "Trapped in Genghis Khan’s tomb with a killer robot..." That's one of Lenora's many adventures in the special library she finds while getting away from her nanny. At the start of the book, Lenora behaves like a spoiled brat, but soon she gets to help out the librarian and proves to be really talented. I hope there are more adventures. PS. I am a librarian, so my review could be somewhat biased. I received a copy of this book from Macmillan Children's Publishing Group via NetGalley in exchange for "Trapped in Genghis Khan’s tomb with a killer robot..." That's one of Lenora's many adventures in the special library she finds while getting away from her nanny. At the start of the book, Lenora behaves like a spoiled brat, but soon she gets to help out the librarian and proves to be really talented. I hope there are more adventures. This story is a librarian and book lover’s dream! A young girl, Lenora, with aspirations of becoming a librarian, is employed in a magical library. She swears to answer any question, no matter the challenge and so begins a wild adventure involving space and time travel, shrinking and unshrinking, and assisting a variety of library patrons from robots to ants. Lenora is a well-crafted character full of spirit and warmth. The library patrons are unique, memorable and colorful. The intensity is well paced and the evil ‘Forces of Darkness’, who seek to destroy all libraries and sources of knowledge, are just the right amount of scary. This page-turning adventure full of facts, twists, and turns is perfect for reader’s eight years and up. Additionally, teachers will love the endless project inspiration stemming from the interesting facts Lenora accumulates during her adventures. This a must read and will certainly be flagged as a kid lit classic in years to come. Thank you to Macmillan Publishing Group & Imprint for sending our #bookexpedition group an ARC to read and review. The Library of Ever is unlike any middle grade book I’ve read. It’s a creative adventure story centered around the importance of knowledge. I cheered for Lenora, the clever main character, as she traveled through the most incredible and humongous library in the world, battling the Forces of Darkness who discourage children from asking questions. The theme in this book, “Knowledge Thank you to Macmillan Publishing Group & Imprint for sending our #bookexpedition group an ARC to read and review. “Don’t let one minor setback throw you off track. No one is perfect.” (118). Publishing in April of 2019, I’m looking forward to sharing this one with my 4/5th grade students and am crossing my fingers for a sequel! My 5th grade daughter devoured the proof copy of this book. She enjoyed time travel and how random the adventures were. The humorously tone of the book was perfect for her. She also enjoyed the theme that knowledge is light. Plus cat! Thank you to the @KidLitExchange network and the publisher for the advance copy of this book. All opinions are my own. The Library of Ever is a delightful middle grades adventure fantasy novel about the importance of and love for books and knowledge. Lenora is the daughter of very wealthy parents who seem to have no time for her and leave her with an inattentive nanny. The nanny takes Lenora to the library, hoping to make a quick stop, and Lenora manages to sneak away from her nanny and find a mysterious part of the library that she's never seen before. There she meets the Chief Answerer of the library and becomes a librarian herself. As a librarian she goes on several wild adventures, befriends beluga whales, penguins, ants, and a time-travelling robot. She also must face killer robots and mysterious and evil men in bowler hats who are bent on destroying the library and the knowledge it contains. This story was very complex but was crammed into too few pages. With some more dedication to the character, this could have easily been a 4 part series. Great visuals but disappointingly few details from the character’s perspective. Really loved this book. Full of adventure and whimsy. Lenora is a fresh and spunky little protagonist and her pure heart and devotion to knowledge is so great to see. The story reflects society quite nicely, and it's a joy to watch Lenora fight back the darkness. Can't wait for the sequel. ARC received from NetGalley. And it espouses the fantastic benefits of books and knowledge, so it's also a great example for younger readers. Where Alice in Wonderland meets Intellectual Freedom, you will find Lenora, 11 year old freedom-fighter of knowledge. Fantasy is not really my favorite, but this one was a really easy read. Super fun too. I love the message - Knowledge is a Light. Well done. I was provided a complimentary digital copy of this book through NetGalley in exchange for an honest review. That said, this is exactly the kind of book I would have absolutely adored as a child, and I still loved it as an adult! Lenora is bored, bored, bored - stuck with a dull and inattentive nanny while her parents are off traveling and probably having all kinds of adventures without her. She spends all day every day being dragged from place to place as the nanny runs errands and visits all k I was provided a complimentary digital copy of this book through NetGalley in exchange for an honest review. Lenora is bored, bored, bored - stuck with a dull and inattentive nanny while her parents are off traveling and probably having all kinds of adventures without her. She spends all day every day being dragged from place to place as the nanny runs errands and visits all kinds of boring people, until one day, the nanny finally says something interesting: we're going to the library! Only to pick up one book so that she can impress an acquaintance, but nevertheless it shouldn't be that hard to disappear for awhile and have some real fun in the kids' section! Thanks to @macmillankidsbooks and author Zeno Alexander for sharing this upcoming MG book with me. THE LIBRARY OF EVER releases 4/30/19. All opinions are my own. Eleven-year-old Lenora escapes from her inattentive nanny through a secret portal at an arch in her local library and lands in the Library of Ever. This vast and most impressive of libraries extends through all of time –historical, present, and future– and exists as a space to seek and find facts and knowledge. Lenora is immediately con Thanks to @macmillankidsbooks and author Zeno Alexander for sharing this upcoming MG book with me. THE LIBRARY OF EVER releases 4/30/19. All opinions are my own. Eleven-year-old Lenora escapes from her inattentive nanny through a secret portal at an arch in her local library and lands in the Library of Ever. This vast and most impressive of libraries extends through all of time –historical, present, and future– and exists as a space to seek and find facts and knowledge. Lenora is immediately confronted by a ten-foot-tall stern library who insists that only employees are allowed in the Library of Ever. Lenora, a lover of libraries and the quest for books and knowledge, applies for a job immediately. After swearing to the librarian oath, she is granted the position of 4th Assistant Apprentice Librarian. Lenora takes her position very seriously and will stop at nothing to help her patrons. Through attending to them, she learns quickly and embarks on many fantastical globetrotting adventures in pursuit of answers, including learning to communicate with whales, penguins, ants, and a tardigrade building a spaceship to Alpha Centauri. But she quickly realizes that a librarian’s job isn’t just finding answers. Librarians are protectors of facts and knowledge too. Lenora soon takes on the role of librarian warrior as she battles the forces of darkness that seek to keep information and “dangerous” books away from children by extinguishing the light of knowledge. Lenora — our eleven-year old heroine — escapes from her (luckily) inattentive n I received a complimentary copy of this book from Macmillan Children’s Publishing Group through NetGalley. Opinions expressed in this review are completely my own. The book will be published on April 30, 2019. Lenora — our eleven-year old heroine — escapes from her (luckily) inattentive nanny through a secret arch of her local library and lands in the aforementioned “Library of Ever.” Confronted with a ten-foot tall stern and very pointy librarian who insists that only library employees may enter, she applies for and is immediately granted a job as the 4th Assistant Apprentice Librarian. Her largely self-directed adventures take her through the Calendar help desk, the cartography section, and a live-action diorama of Bubastes (look this up too!). She helps penguins find their way home, a tardigrade (yes — this is a real thing — look it up!) get directions to Alpha Centauri, and a King in the year 8000 unravel some trouble with time. My absolutely favorite part is when she dons a pheromone interpreter (in her nostrils) in order to help her understand a group of troubled ants. What a wonderfully written, exciting tale of young Lanora and her adventures in the library. This book is brought to life by the storytelling and is carried by the fun adventures that Lanora finds while visiting the library. There are so many wonderful lessons that a reader can learn from this book. As a librarian I love the messages that are present in this book. I love how the author creates such a wonderful world inside the library full of amazing experiences, lessons, and imagination. I feel What a wonderfully written, exciting tale of young Lanora and her adventures in the library. This book is brought to life by the storytelling and is carried by the fun adventures that Lanora finds while visiting the library. There are so many wonderful lessons that a reader can learn from this book. As a librarian I love the messages that are present in this book. I love how the author creates such a wonderful world inside the library full of amazing experiences, lessons, and imagination. I feel like this is a sneak peek into the mind of young readers who really enjoy the library and the joy reading can bring to everyone. A wonderful book. Can't wait for the release to share with everyone! The Library of Ever is a cute short book filled with big words, science, and most importantly FUN! Lenora is a reader, but until today couldn't get her nanny to go to the Library. Once inside, Lenora slips away and finds herself in a secret Library, and herself an apprentice librarian. Her adventures in Calendars has her traveling through time with a malfunctioning robot vizier and her time in Maps takes her around the globe (literally) as she talks to whales and penguins on her search for an an The Library of Ever is a cute short book filled with big words, science, and most importantly FUN! Lenora is a reader, but until today couldn't get her nanny to go to the Library. Once inside, Lenora slips away and finds herself in a secret Library, and herself an apprentice librarian. Her adventures in Calendars has her traveling through time with a malfunctioning robot vizier and her time in Maps takes her around the globe (literally) as she talks to whales and penguins on her search for an answer. But there are those that don't want answers, science, or truth. Can Lenora escape their creepy clutches and give Library patrons the answers they seek? Join Lenora in the Library of Ever in her quest to become a librarian, help patrons, and discover more about herself and everything else! When Lenora's parents leave her with a nanny to travel the globe, book loving Lenora is frustrated with the adults who dictate her life. 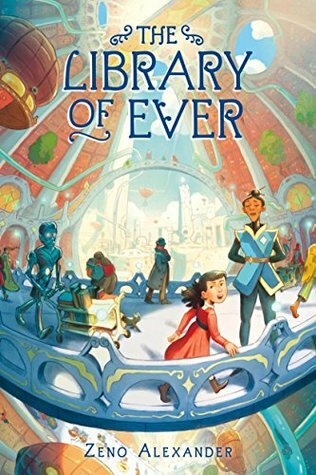 When at the library (so her nanny can get a book for the sole purpose of impressing someone), Lenora stumbles into the Library of Ever and is hired as a fourth I received an ARC from NetGalley in exchange for an honest review. This book is a complete delight. It's hard to describe, but it has a classic feel with a rambling plot similar to Fortunately, the Milk by Neil Gaiman. I read it aloud to my kids, and I thought my 12-year-old might not be into it - it feels on the younger MG side - but she actually LOVED it. It's very unique and full of imagination. It's also quite different from many of the other library-set MGs out there. What a fun adventure book with an important message. As a librarian, I think all librarians are heroes and Lenora certainly is, making tough, daring choices all in the name of knowledge. Will there be a sequel? I certainly hope so. Sooo good - I want to get a copy for my library. Loved it. Do you ever get bored and hope for adventure? Well, that is exactly what Lenora is facing. Her parents are off traveling the globe and they have left Lenora with a nanny. Lenora is so bored doing everything that the nanny wants to do, but when she has to stop off a the library, Lenora is thrilled. She sneaks away from the nanny so that she can go to the children's section. On the way she gets lost and ends up in a part of the library where she does not belong. This part of the library seemed muc Do you ever get bored and hope for adventure? Well, that is exactly what Lenora is facing. Her parents are off traveling the globe and they have left Lenora with a nanny. Lenora is so bored doing everything that the nanny wants to do, but when she has to stop off a the library, Lenora is thrilled. She sneaks away from the nanny so that she can go to the children's section. On the way she gets lost and ends up in a part of the library where she does not belong. This part of the library seemed much older with stone wall, bridges and tunnels. There were books and librarians everywhere. As she was staring in awe at the view before her, she is interrupted by one of the tallest ladies she has ever seen. Lenora is told she must leave because she doesn't work there. Lenora doesn't want to leave so she asks if she can work there and the lady, Malachi, approves. Malachi puts Lenora to work right away helping patrons in various rooms of the library. In order to help these patrons she must travel far and wide and meet some pretty incredible people (and insects, and animals, and robots). Each time Lenora helps someone, she gets a promotion. However, with every turn she faces challenges and dangers. There are men who are trying to destroy all knowledge and Lenora is in the way. With every adventure, Lenora is threatened and her life is in danger. Can Lenora avoid these men and continue to do her job? Or will they finally put an end to Lenora and all the books that she finds precious? Read this incredible book to find out! What is a girl to do when her parents are off on a trip to Europe and have left her in the care of a nanny who spends all her time visiting her own friends and dragging her charge along like excess luggage? Well, Lenora waits for the right moment and then makes a break for it. Being a smart girl our protagonist makes her move while they are at the library (so the nanny can check out a book to show off to her friends). As she searches for the children's section, Lenora encounters a strange arch t What is a girl to do when her parents are off on a trip to Europe and have left her in the care of a nanny who spends all her time visiting her own friends and dragging her charge along like excess luggage? Well, Lenora waits for the right moment and then makes a break for it. Being a smart girl our protagonist makes her move while they are at the library (so the nanny can check out a book to show off to her friends). As she searches for the children's section, Lenora encounters a strange arch that leads her to the ultimate library. When she is made the "fourth assistant apprentice librarian," her adventures really begin. Between helping patrons from the future, rescuing stranded penguins, finding lost kittens, and other amazing help desk assignments, Lenora encounters menacing figures in bowler hats who seem intent on preventing patrons from using the library. The head librarian, Malachi, tells her these characters are the "Forces of Darkness" and have always been around. Holding to the belief that "Knowledge is Light," Lenora does her best to fight the insidious actions of the dark. As she tells two of the figures when they point out she is just a child, "I'm also a librarian. And I'm not going to hide the truth from anyone." Lenora's research into patron queries will have readers learning about Leap Day and Leap Years, the tallest mountain in the world, the ancient Egyptian goddess Bast, and tardigrades. They will also encounter robots, beluga whales, ant colonies, and various other wonders that will spark interest in new and exciting subjects to research for themselves. This middle grade tale is a good match for fans of The Ninja Librarians by Jen Swann Downey, or readers who enjoy books about books such as Escape from Mr. Lemoncello's Library or The Book Scavenger. The Library of Ever, by Zeno Alexander, is a zany middle-grade adventure. Readers will delight in Lenora’s journey through the ultimate library, where anything - including time travel - is possible. We meet Lenora during her summer break, after her well-to-do, business-minded parents have left on a trip to Europe, leaving Lenora with an inattentive nanny. Lenora is stuck going around town everywhere the nanny wants to go, and is terribly bored. But when the nanny stops at the library, things get The Library of Ever, by Zeno Alexander, is a zany middle-grade adventure. Readers will delight in Lenora’s journey through the ultimate library, where anything - including time travel - is possible. We meet Lenora during her summer break, after her well-to-do, business-minded parents have left on a trip to Europe, leaving Lenora with an inattentive nanny. Lenora is stuck going around town everywhere the nanny wants to go, and is terribly bored. But when the nanny stops at the library, things get interesting. What follows is a time-traveling, topsy-turvy ride through a mind-bending library whose walls expand as wide as the universe. Lenora finds herself appointed to the job of fourth apprentice assistant librarian, and for every library patron she helps, she earns a promotion. She meets robots, amazing insects and begins to learn many new amazing things in the library. But there is a sinister man that is following her, and she has been told that she must protect something very important: knowledge. And for every task she successfully completes, the closer danger gets. A wild adventure that will have librarians, readers and book lovers everywhere whizzing through it, The Library of Ever is a bookish journey of fun! Filled with interesting facts about history and language, it’s a fast-paced, smart read that doesn’t skimp on humor and piles on the adventure. Readers young and old will enjoy Lenora’s trip through the ultimate library; the only downside to the book is that you will wish it wasn’t over quite so soon. *Thank you to Kidlitexchange and Macmillian Publishers for an ARC in exchange for an honest review. Thank you @kidlitexchange @macmillankidsbooks and @zalexanderbooks for the review copy of this MG book. All opinions are my own. It’s set to release 4.30.19. This is such a fun story full of wonderfully imaginative scenes and unique adventures. I adored Lenora. A young girl in love with the library and all of the knowledge that can be discovered amongst stories and books. She stumbles into a secret portal and finds herself in the Library of Ever where she quickly gets tasks as a “fourth assistan Thank you @kidlitexchange @macmillankidsbooks and @zalexanderbooks for the review copy of this MG book. All opinions are my own. It’s set to release 4.30.19. This is such a fun story full of wonderfully imaginative scenes and unique adventures. I adored Lenora. A young girl in love with the library and all of the knowledge that can be discovered amongst stories and books. She stumbles into a secret portal and finds herself in the Library of Ever where she quickly gets tasks as a “fourth assistant apprentice librarian” and begins helping patrons find the answers to many interesting questions. Readers learn about Leap Year, the place with the longest name in the world, where the highest mountain is located and so much more. Lenora doesn’t just read books to find these answers. Instead she travels across a virtual map, chats with penguins, witnesses the impressive inner workings of an ant colony, finds herself in space with a very smart tardigrade. Along the way she earns different positions and even learns about a group of people who are out to destroy the seekers of knowledge. A fun young middle grade fantasy novel. Loved curious and insightful Lenora, always taking notes of her discoveries and questions. The trials/adventures she goes on are quickly resolved (1-2 chapters). This would work for bedtime or classroom reading. Don't expect this to be at the Percy Jackson-level of intricacy. To me this felt like more of an introduction to fantasy for readers almost but not yet ready to dive into those longer sorts of adventures. I did feel like the villain confrontations lived on a different level of the story - the adventures were like rich and vibrant colors while the confrontations felt black and white in comparison. They have fairly simply stated motives and the message to the reader - value libraries and knowledge - is clear. I think I was expecting something more subtle and teased out over time. For a younger reader, though, this might be a better fit. Regardless, the message is an important one for our culture today and for our future. Lenora, age 11, is bored out of her mind! Her wealthy parents are off on a world-wide cruise and Lenora is stuck with her inattentive nanny. While off doing errands (BORING! ), they stop at the library. Lenora ditches her nanny and soon discovers a mysterious archway which leads to an enormous and wondrous library. The library has every book ever written in every culture. Lenora convinces Malachi, the C I received this e-ARC from NetGalley in exchange for an honest review. All opinions are my own. This ode to librarians is a fast-paced, action-packed story for middle grade readers and adults alike. It can be described as a cross between A Wrinkle in Time and Escape from Mr. Lemoncello’s Library. It may seem a bit disjointed as Lenora mores from adventure to adventure but it does work for this book. It all works out in the end. I expect we will see more of Lenora in the future.